Here is my second shawl pattern “Mulberry Wine Shawl”. It’s a triangular scarf/shawl with a repetitive pattern and almost no ends to weave in. Mine is made of a wonderful yarn containing baby llama wool and mulberry silk. It is so soft and very nice to wear. I’m really not a shawl person. I’m wearing mine as a scarf/shawlette instead (you can find an image of me wearing mine further down )but the great thing with this pattern is that you easily can make it as big as you want just by adding some more rows. At a first glance the pattern might look very complex but as soon as you have come through the first repetition I’m sure things will move on more smoothly. The yarn used in this pattern was sponsored by Järbo Garn . I used almost 4 skeins for my shawl. 1 skein = about 165 m.
Note: I have used another yarn for the tutorial images to make it easier to see the stitches. To prevent the edge from curling crochet very loose on the first ch 3 on each round or maybe even ch 4 instead. Turn your work after each round. All rounds (except round 1) of the base pattern starts with a (ch-3, 2 dc) in the first st and ends with 3 dc’s in the 3:rd ch of the beginning chain from previous round. The pattern is divided into 3 parts: base pattern, edge and upper edge. 3 dc’s in top ch . 3 dc’s in top ch (image 4). 2 dc (image 3, only 1:st dc in image), 3 dc’s in top ch (image 4). 4 dc, 3 dc’s in top ch (image 3). 5 dc, 3 dc’s in top ch (image 4). 7 dc , 3 dc’s in top ch (image 4). The repetitive part of the base pattern contains of round 9-13 below! Instructions inside ** is repeated as many times as needed along the side until you meet the repeat requirement stated afterwards. !! Note that the repeats ends in the middle of the instructions between ** !! Round 9: In this round we start new mulberry patterns and finish the old ones. repeat until 3 st’s left, 2 dc, 3 dc’s in top ch (image 4). repeat until 5 st’s left, 4 dc, 3 dc’s in top ch (image 4). repeat until 6 st’s left, 5 dc, 3 dc’s in top ch (image 6). repeat until 8 st’s left, 7 dc, 3 dc’s in top ch. Repeat round 9-13 as many times as you want and finish off the base pattern by making one last round 9.On the last repeat of round 9 you should skip the start of new mulberry patterns (i.e the (ch 3, sc between st 2 and 3 ahead, ch 3)) and just make dc’s there instead. Let’s go on with the edge! Ch 3, 2 dc in next st, dc in each st until corner ch-3 sp, (2 dc, ch 3, 2 dc) in the ch-3 space, dc in each st until 1 st’s left, 3 dc’s in top ch. (dc, ch 1, dc) in top ch (image 4). (ch 3, dc) in the top ch (image 8). (ch 3, dc) in the top ch (image 4). Depending on how many times you repeated the base pattern you could end up with 2 different solutions on this round. If you’ll get an extra ch-5 left before the corner ch-3 make 4 dc’s in it and also 4 dc’s in the first ch-5 after the corner ch-3 sp. sc in last ch-5 sp (image 5). I have added some extra rows along the upper edge to make it prettier and more comfy against the neck. Round 1: Do not turn your work for this round!! ch 7, 3 hdc in next ch-3 sp (image 1), make 2 hdc for each round along the upper edge (image 2), 3 hdc’s in last ch-3 sp (image 3), ch 4, dc in first st from last round of edge (image 4). Round 2: Turn your work! Work this round in front loop only (FLO)!! 4 hdc’s in last ch-4 sp (image 4). Round 3: Turn your work! ch 1, sc in each st along. 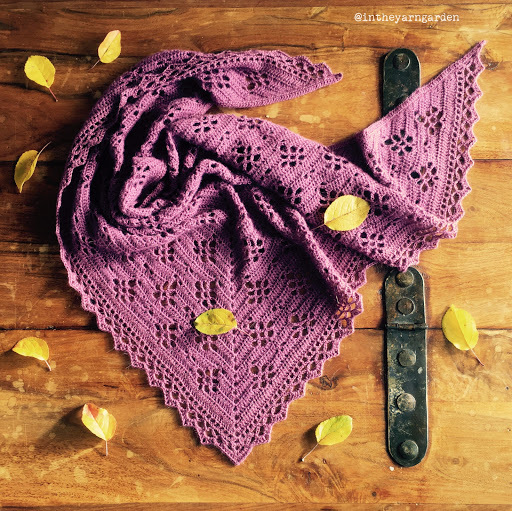 I put a lot of work into my patterns so if you use them and share images on social media I would be very happy if you share a link to my blog and tag your work by #intheyarngarden (or #mulberrywineshawl for this shawl). That makes it easier for me to see your creations which I’d love to see. You do such lovely work. Hi! No questions are to stupid to be asked. I’m sorry but there is no YouTube video available that I’m aware of. Unfortunately I don’t have time to make any either. I hope that you find your way somehow. My question is, What is ‘one 5-lmb’? It’s supposed to say ch-5 space. I guess I missed it in the translation from the Swedish version 🤭☺️. Thanks for finding that error! I will correct it. Another stupid question! At the very start you have 2 dcs chain 3 2 dcs. Then next you turn, chain 3, 2 dcs in the next stitch then dc. Where do you put the next dc? After chaining 3 you only have 1 dc to put the 2 dc’s. I hope this make sense. I am a beginner! Thank you! After chaining 3, make the first 2 dcs of round 2 in the last dc of round 1. Then you’ll make the single dc in the next dc (Which would be the second last dc of round 1.). After that you’ll make 2 dcs around the ch-3 from round 1. Then chain 3 and make 2 more dcs around the ch-3 from round 1. Take a look at the image showing the steps of round 2. Also, round 4 says sc between st. 2 and 3 ahead. Could you explain?